The Cocker Spaniel wants to please his owner and excels at training. An energetic, bouncy dog best suited to an active lifestyle. Progressive retinal atrophy (PRA) — an eye condition causing blindness. Familial nephropathy (FN) — a serious kidney disease causing death in young dogs. Adult onset neuropathy (AON) — a neurological disease affecting limbs. Acral mutilation syndrome (AMS) — a disease involving self-mutilation of the limbs. Hip dysplasia — abnormal formation of the hip socket, which causes lameness and pain in the joints. DNA testing and screening/scoring systems are available for all these conditions, and, as a minimum, reputable breeders will be screening their stock for PRA and FN. The other diseases occur less commonly. Adult dogs and dogs who are to be bred from should have annual eye tests so any signs of disease can be spotted early. Dogs with signs of eye disease shouldn't be bred from. All dogs must be tested for glaucoma; this is a one-off test and can be done from eight months of age upwards. A family dog who will want to be involved in all his family does. Good with children and other pets if socialised early. An energetic, bouncy dog best suited to an active lifestyle. Needs about 60 minutes of physical exercise a day, including off-lead walks and play. The Cocker Spaniel wants to please his owner and excels at training. Extremely intelligent but strong-willed and has his own mind, so will need a firm, fair hand. Working Cockers will take as much exercise as you can give them — so these dogs need owners who can provide them with plenty of physical and mental stimulation on a daily basis. Although show-type Cockers are not as active as the working strain, they can also be energetic, but are easier to tire out. Most adult Cocker Spaniels will be very happy having a 30-minute walk morning and night, but if you want to go on a long trek in the country, they will be more than happy to walk with you. Many Cockers enjoying fetching and retrieving a ball, and both types can excel at canine activities, which means that they benefit from having a knowledgeable owner who can put in plenty of patient training. A Cocker Spaniel’s coat will grow continuously and moulting is minimal, which means that they need grooming at least once a week to keep their coats in good condition. A comb is the most effective tool to get through their feathers, while a brush is good for polishing the coat on their backs. They will need regular trimming by a professional groomer or yourself every six to 12 weeks. Some owners choose to cut their Cocker’s coat short to suit their lifestyle, especially if they often get muddy. If they’re not walked regularly on a hard surface, their nails may need clipping. You should also ensure that their dewclaws don’t get too long. The Cocker Spaniel's long ears need to be checked regularly as they can become infected easily if not kept clean. Cocker Spaniels are fairly easy to feed, but must be a good-quality diet. Cockers can be quite greedy so watch portion sizes too. What is the difference between working or show Cocker Spaniels? 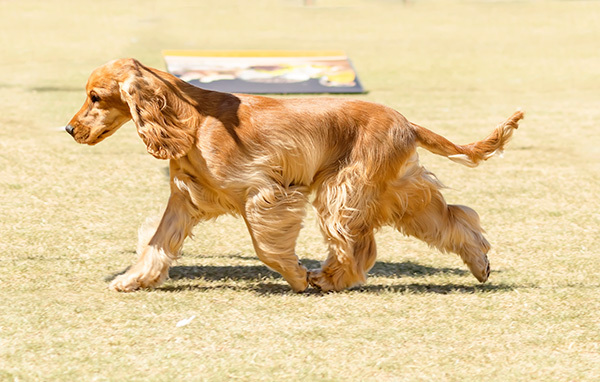 There are two strains of Cocker Spaniel — the show type and the working type (often referred to as working Cockers) — which are each bred for different purposes with different attributes. Show-type Cockers are more commonly seen as family pets, and their compact size and appealing looks make them a popular choice. Working cockers are bred as working gundogs, and therefore have a lot of energy, as they need to have stamina in order to work all day in the shooting field. In the right hands, they make great pets for active homes, and are becoming an increasingly popular choice for those who participate in sports such as agility and flyball. Working Cockers can also look quite different to the show type. As show breeders are trying to breed dogs that closely resemble the Kennel Club breed standard, working Cocker breeders consider working ability to be their top priority and are less interested in what their dogs look like. In general, working Cockers have finer coats and their body shape tends to be less compact than show Cockers. Higher than average grooming needs.